The actual lactic acid content of Acidulated malt, is ~2% (by weight). The rule of thumb is for each 45.5kg (100lb) of grain, 1% or 455g (1lb) Acid malt will drop mash pH 0.1. The actual amount of lactic acid present on 455g of Acid malt would be 455g x 2% = 9.1g. For beers without roasted malts, the HomeBrewTalk "water primer" recommends your grist include 2% Acid malt. For 45.5kg of grain, 2*8.54ml = 17.08ml lactic acid solution or 0.38ml/kg. At the recommended dosage, a typical 8.5kg grist would include 170g of Acid malt or about 3.25ml of lactic acid solution. Using the noted calculations, I mashed 8kg of Weyermann Pale Ale Malt and 0.5kg of Domestic Flaked Barley with 3.25ml of lactic acid. The water:grist ratio was 1.3qt/lb. Important note, my baseline city water is extremely soft. Also, the CaC03 alkalinity is below 35ppm (~28). It's great water to build on. I treated the entire volume of hot liquor (50l) with 12 grams Gypsum and 8.4 grams of Calcium Chloride, the resulting mash pH was 5.6 @ room temperature. An additional 2ml of lactic acid, total 5.25ml in the mash, resulted in the idea room temperature pH of 5.4. I actually took a reading at mash temperature as well, hard on the meter I am told, the pH read 5.1-5.2. Fred Bonjour's Amarillo Pale Ale, I subbed Victory and Pacman yeast. The Amarillo had a distinct funk at first, the orange tangerine notes have only started to come forward after a few weeks in the keg. A freezer full of hops, sacks of malt, empty carboys and a fresh culture of ESB yeast sets up well for a "summer strength" American Pale Ale. The goal? Aromatic, well balanced, light to medium bodied American style ale with serious pulling power. The grist is simple; Pale Ale Malt, Flaked Barley and Crystal 40 to the tune of 1.050. The plan is to mash just the Flaked Barley and Pale Ale Malt @ 150F for 60 minutes before adding the Crystal 40 during Vorlauf. 30% (70g) Galaxy split between two carboys, 35g each. I'll add an additional bittering hop, probably Columbus or Chinook @ 60 to hit 35 IBU's (Tinseth). To better estimate the final bitterness, whirlpool hops are entered to my brewing software as a 5 minute addition. I have found this to be a reasonable estimation of their bitterness contribution. To dial in my water profile, I'll treat the entire 60 litres of brewing liquor with lactic acid to a room temperature pH of 5.4. Then add 2 tsp of Calcium Chloride, 3 tsp of Gypsum and a campden tablet. This should yield an appropriate mash pH with a final Calcium concentration of ~ 100ppm. So, I likely rushed through the first keg and my initial review doesn't do this beer justice. It's reeeeally come into it's own, truly. For the 2nd keg, I opted to forgo the dry hopping, this was most certainly the right call. It's made a world of difference. What was once a dank, bitter hop forward beer (with no real character to speak of), has now become a malty goddess. The Munich and Pale Chocolate malts are playing so well off each other. Along with the biscuity Pale Ale Malt... what can I say, a match made in heaven. I must say however, the Willamette hops added during the boil, are not lost. There's a supremely balanced floral bitterness which I absolutely adore. Maybe the First Wort Hops? Pacman is also glorious. The beer is all sorts of chewy, beautiful mouth feel, incredible. All I attribute to this amazing yeast. What a few extra weeks of conditioning can do to a beer! I can't wait to make it again! Pictured left is a Scottish 70/- from Jamil's "Brewing Classic Styles". In the book he offers two recipes on the same style, one more traditional, the other a modern take on the classic. I opted the modern version which includes 2-Row, Munich, Honey Malt, both medium and dark Crystal. Finally Pale Chocolate Malt. I brewed to an OG of 1040 with a single addition of Target @ 60 minutes for 13 IBU. I mashed as prescribed @ 158F, fermentation stopped at an FG of 1.014-1.016. I fermented with 4th gen Pacman yeast harvested from a bottle of Rogue Brutal Bitter. The beer is excellent! Lots of character for such a small beer. Nice body, head retention, great colour. Could see this becoming a house style. Easy drinking, satisfying and you can drink two or three and feel fine. Great social brew for sure. Chinook/Cascade/ Columbus @ 25 min, 15 min, 5 min and 1 min. IBU count of ~ 36. Each addition featured a 2:1:1 ratio. Example 2:1:1 Chinook:Cascade:Columbus followed by 2:1:1 Cascade:Chinook:Columbus followed by 2:1:1 Columbus: Cascade:Chinook. 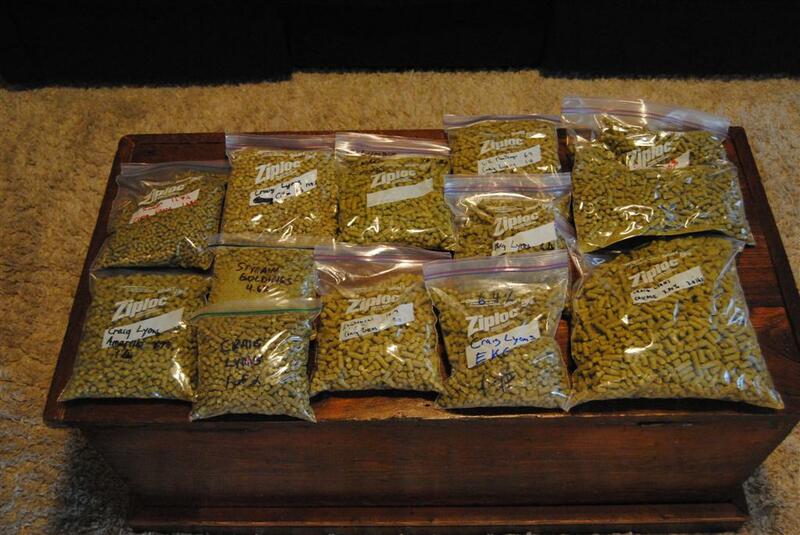 I then did the same for two dry hops, each 4 days long. A total 240g for 20 Litres of beer! First off, the beer drinks nothing like 36 IBU, more like 50 or 60. It's clear with decent head retention. Love the colour, classic IPA. I am picking up some slight oxidation. I dry hopped this in a secondary which I might not do again. I have had better success hopping in the keg. Intense grapefruit and pine flavours. It's very nice but could do with some more body. I used 8% CaraPils so perhaps a slightly higher mash temp might be in order. Nice aroma but not as pungent as I was expecting. I am getting little from the Columbus. The Cascade and Chinook shine. Fermented with Pacman, finishes quite dry. Drinks like an IPA not the intended APA. Pacman yeast, fermented ambient (18c), finished high @ 1018. Great head retention. Sticky lacing evident. Medium body, could use more. Doesn't taste overly sweet contrary to the high finishing gravity (not sure what happened there). Nicely bittered. Subtle floral, earthy flavours and aroma. Hints of roast, loving Pale Chocolate malt. Could use perhaps another few percentage points of crystal malt. Nice beer!